A love affair with skiing that began as a 15 year old schoolgirl and a chance opportunity grasped with both hands led Jane McGarry to change her suburban life as a teacher in Bolton for an idyllic home in the French Alps. “I’d started skiing on trips with my school and loved it from the start” says Jane “I’d already taken some ski instructor courses but my job as a secondary teacher was my main occupation. Jane met her husband, also a ski instructor and together they set up a residential ski school business and started a family. The French mountain village of Chatel ticked every box. Just an hour and a half by car to Geneva airport, Chatel is a village with a real local community. All the businesses are family owned and run by local people who appreciate the tourism opportunities the mountains bring but also retain an authentic rural lifestyle that endures year round. It’s a destination favoured by French holidaymakers and there can be no greater endorsement to the quality of the place, from scenery to skiing, summer activities, exceptional food and value for money. As Jane’s family grew she faced tough decisions about the lifestyle and education she was providing for her daughters. Splitting their time between Chatel and Dublin the girls attended a mix of French and Irish schools reflecting the busy tourist seasons. Chatel provided opportunities for freedom the UK cannot offer with Tamsen and Kirsty free to explore the village market without fear from a young age. They also became avid skiers starting almost before they could walk. “By the time they were 9 or so they could out-ski me no problem” says Jane and their passion and dedication for the sport culminated in both girls representing the UK in the winter Olympics. The growing up and moving on of their children prompted Jane and Ian to move into holiday rental repurposing an apartment within their home to provide holiday accommodation for independent travellers. 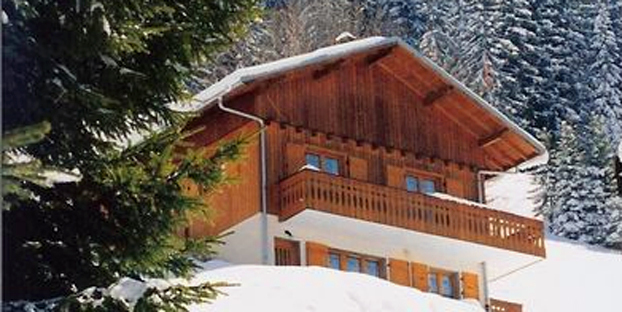 “We built our house to our own design with the help of a local architect and the apartment was originally included as accommodation for ski school staff. As times changed we felt it was better used as a holiday let giving customers the chance to experience a quiet, residential area instead of the busier apartment blocks more generally available. With a family background in the service industry Jane and Ian are well equipped to offer their guests everything they need for a fabulous holiday, their success in achieving this is evident by the amount of repeat visits they get. “A lot of guests through the ski school or apartment become lifelong friends” says Jane “They came back year after year because they love the area like we do and like the style of ski instruction we provide. And it certainly seems to be a dream destination; in the winter season there are over 700km of pistes including a glacier and unlimited off piste skiing opportunities, “So even after over 25 years skiing here we still find new routes to explore!” and in summer the mountain biking and hiking is unparalleled and the mountain air keeps temperatures pleasant. All year round the sensational views take your breath away and with day trips to Lac Leman, Evian and even Italy within reach one visit will never be enough. Treat yourself to a meal at this wonderful restaurant, the food is really exceptional with a menu that features delicious alpine specialities and local ingredients. We always go here for family celebrations, birthdays and so on, I tried to persuade my daughter to have her upcoming wedding here but she decided to tie the knot in Dublin instead. The ski slopes above Chatel offer incredible views, take a moment to spot Lake Geneva below, Mont Blanc to the south and on a clear day you can even see the Matterhorn. Chatel and the surrounding area are so beautiful in the summer with a green landscape that goes right up to the mountain tops. The terrain is ideal for mountain biking and hiking and there is a skeleton ski lift service so you can travel up in comfort and walk down at leisure. I often take my daughters’ dog on walks this way, he’s not that keen on the lifts but knows it’s worth it for the wonderful walk back down! 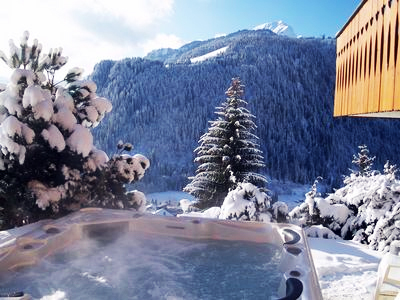 This looks fab – we might think of coming skiing in Chatel. Good evening, just stumbled upon this whilst looking at images on “hot ubs in the french alps”, and just wondered if you could email me details of your rates etc for a visit in July 2013. Thankyou and a very merry christmas to you and your family!